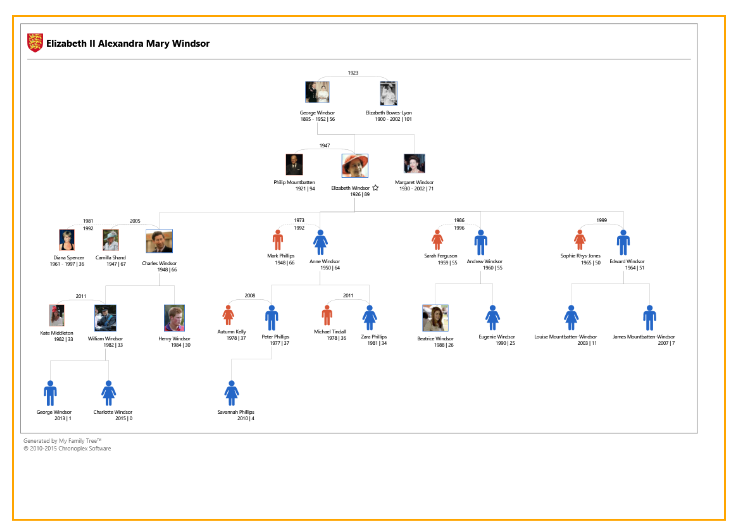 Many files, reports and other onscreen content can be printed using My Family Tree. Images can be printed using the built in Windows® Print Pictures dialog. This includes full options for scaling and quality settings as well as printing both albums and single images. Files can be printed automatically if an application installed on your device is registered as the default application for printing that particular file type. If no default print handler is registered, you will have to determine which application can be used to open and then print the file manually. Reports can be printed directly from the application. The charts, statistics and story views use a custom print experience which allows you to output large on screen content either scaled to fit a single page or spanned across multiple sheets. Cut marks and labels are added to multipage print outs so that these can be cut up and joined to form a single sheet. The printer box displays all available printers. 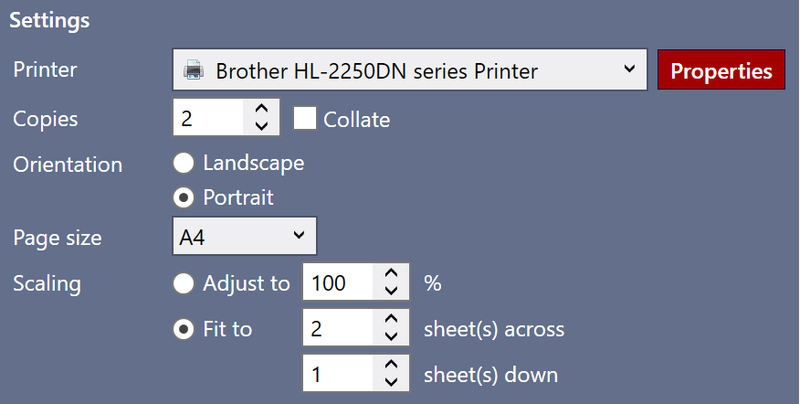 To edit the selected printer's advanced properties use the "Properties" button. If your printer is not listed, right click the printers box to add a printer or refresh the printer list. Choose either landscape or portrait page orientation to make the best use of the paper in relation to the dimensions of the content being printed. Choose from page sizes supported by the printer. The "adjust to" option is best used to make small adjustments to scaling to reduce white space. The content can be scaled between 10% and 200% of its original size. The content will automatically span across as many pages as needed to achieve this. Alternatively, the "fit to" option can be used to shrink larger content to fit a specified maximum number of sheets across and down. Scaling options are not available when printing stories. In this case, the content is paginated automatically. The printout title can be customised using and you can optionally include the family crest if you have added one to your file. The preview image displays a preview of how the content will be rendered by the selected printer. The orange lines indicate the approximate positions of page boundaries. Fig 3. A print preview.